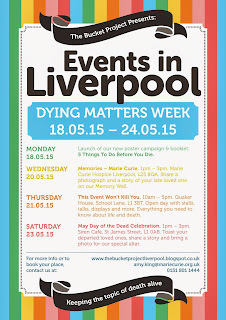 Since our launch in 2011, we have been involved in four Dying Matters Awareness Weeks! 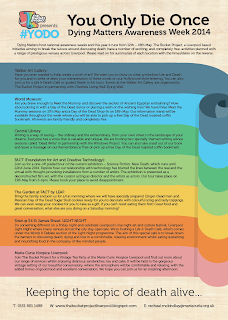 This week is used to spread awareness around the topics of death, dying, loss and planning for the future. For more in-depth information head over to the Dying Matters Website. Volunteer Training - in partnership with Liverpool Bereavement Service we provided training for existing volunteers, incorporating listening skills, the legal aspects of death and signposting services. Free Will workshops - over two days Tower Law held free will workshops at the Marie Curie Hospice in Liverpool, with 16 people taking up the offer. 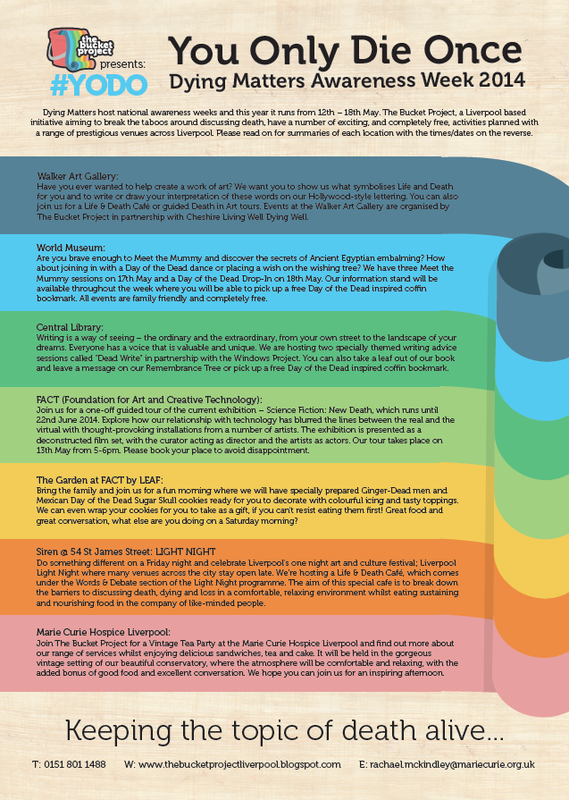 Cultural Funeral Traditions Event - our first open event about death was held at the Bluecoat in Liverpool City Centre. People had the chance to visit information stalls to chat about how different cultures deal with death. There was a horse-drawn hearse, kindly supplied by the Co-operative Funeralcare to help promote the event. 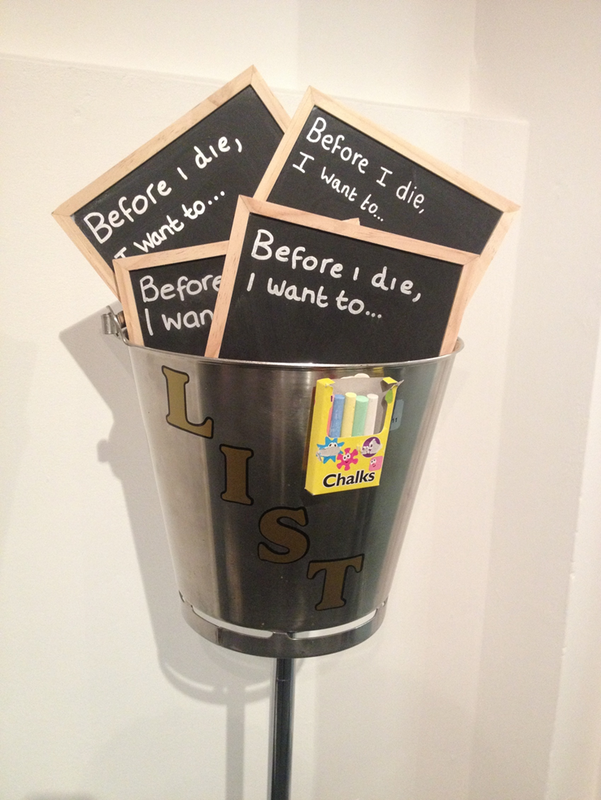 Located in the India Buildings, Liverpool City Centre, we featured a chalk wall for people to write their 'bucket list' wishes on. Rolls of black paper were placed on the walls and replaced when full. This was extremely successful and is a trend around the world. Our first conference “Keeping the Topic of Death Alive” was popular, with around 40 attendees. Presentations were delivered by: Professor John Ellershaw, Elaine Owen and Rachael McKindley and were followed by interactive workshops themed around Partnerships, Events and Debates/ Discussions. Delegates were from a range of fields and included representation from: local community groups, funeral directors, charities, support groups, solicitors, churches, acute trusts, hospices, clinical networks, palliative care specialists plus many more. 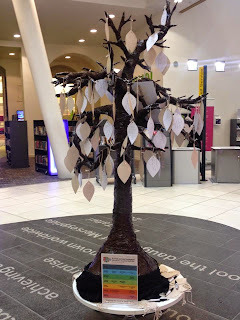 There were two launch events, at the Central Library and the Walker Art Gallery, debuting our Remembrance Tree and ‘life’ and ‘death’ interactive lettering. Over 400 people contributed messages and placed them on the tree, one of our most successful engagement tools to date. On the second day of Dying Matters we held a ‘Dead Write’ workshop at Central Library, where we discussed a wide range of topics and assessed how death, dying and loss is incorporated in works of poetry and ways you can approach this subject yourself. Working in partnership with The Windows Project, the discussion was fantastic, with members reading their own excerpts of poetry to the group and suggesting ideas for future work. 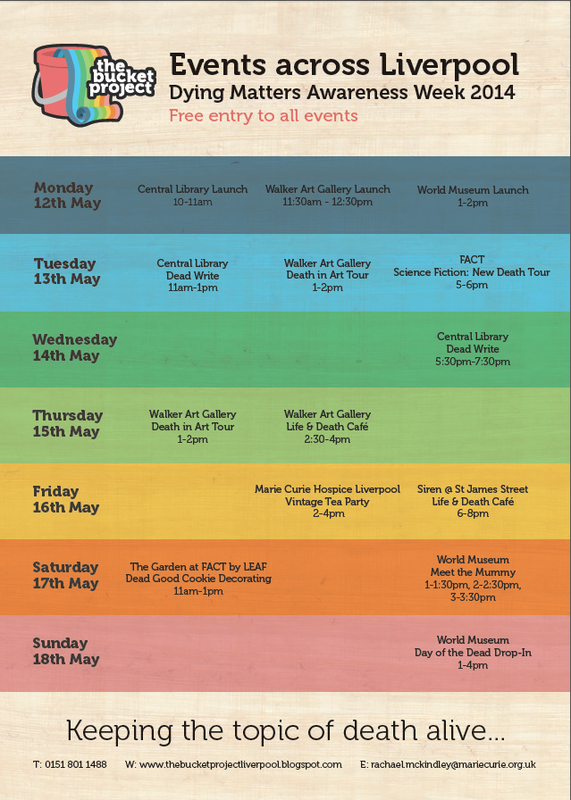 The ‘Death in Art’ tour took place at the Walker Art Gallery in the afternoon and in the evening, we rounded off Day 2 with an exclusive tour of the Science Fiction: New Death exhibition at FACT. Day 4 of Dying Matters Week and a busy one at that! 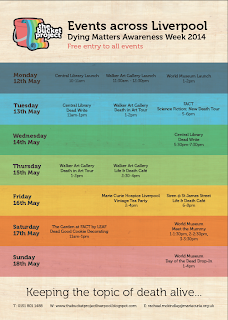 We held another Death in Art tour followed by our very first Life and Death Café at the Walker, discussing elements of life and death in warm and welcoming company. The Vintage Tea Party at the Marie Curie Hospice Liverpool took place in the beautiful conservatory and was a huge success with staff, patients, volunteers and visitors enjoying our homemade cakes and free refreshments. People who don’t often come in to contact on a daily basis had a chance to get to know each other and the roles each of them play in the hospice. We continued serving homemade cake throughout the evening at our Life and Death Café at Siren, 54 St James Street, to celebrate Liverpool Light Night. It was an early start for the penultimate day of Dying Matters Awareness Week in The Garden at Fact by Leaf. We hosted a ‘Dead Good Cookie Decorating’ session for children and parents with GingerDead Men and Day of the Dead sugar skull cookies. In the afternoon we were at the World Museum where two ‘Meet the Mummy’ sessions were taking place. What could be better than a celebration for the final day of a fabulous week? 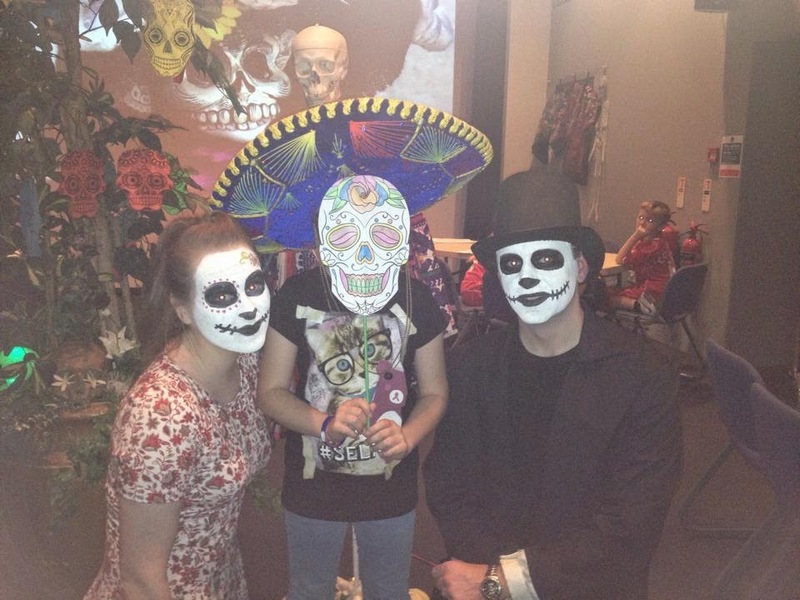 In partnership with the World Museum, we put on a ‘Day of the Dead Drop-In’ where people made masks and put a wish on the Mexican Wishing Tree whilst listening and dancing to music. Overall, this week was a fantastic success, with roughly 700 people getting directly involved and reaching in the region of 380,000 listeners when we were featured on the BBC Merseyside Drivetime show throughout the week! Marie Curie Memories - We were told at our Day of the Dead Celebration that some families want a non-religious celebration of their late loved ones and this is what this event aimed to do. Staff from the hospice contributed stories on specially prepared daffodils about their memories of patients and families they have worked with. At a vintage-style tea party in Marie Curie’s beautiful conservatory, we hung the daffodil memories like bunting and were ready and willing to talk and listen. This Event Won't Kill You - The biggest event of the week with a number of stallholders and guest speakers booked from 10-5 at Quaker House in the city centre. Despite massive efforts with promotion from our team and some of our members, visitors to this event were in the single figures. Day of the Dead Celebration - Our last event of the week, and most popular, took place at Siren Café on St James Street. People stopped by to look at the photographs on the altar, particularly enjoying the ones with stories written on the back. The Topic of Death Cards sparked some interesting discussions but most wanted to reminisce about late loved ones and share happier memories, rather than focussing on the sadder times. 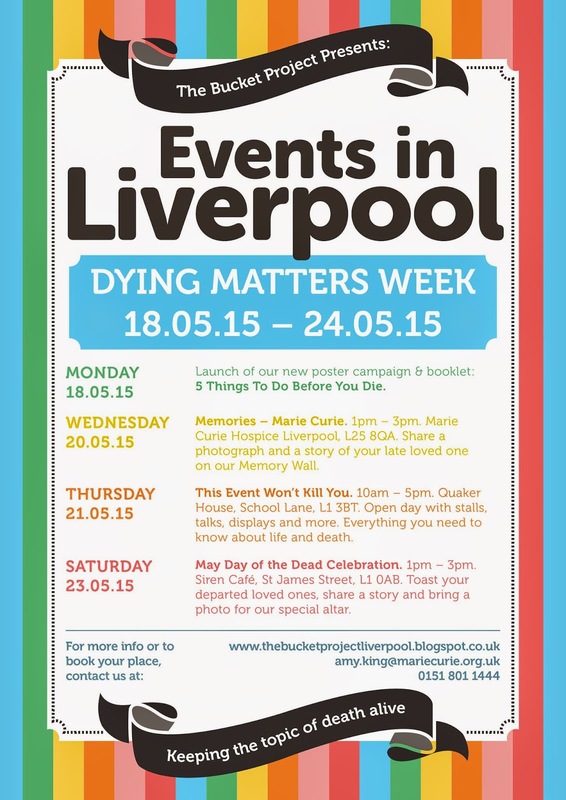 Overall we have had very successful Dying Matters events since the start of the project and hope to keep the topic of death alive in Liverpool, in the future.